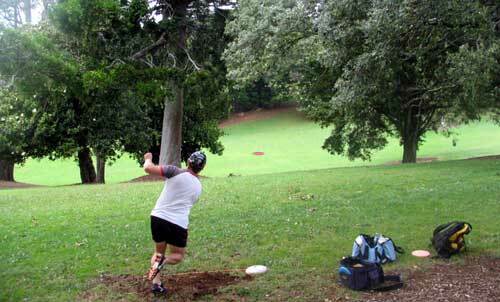 Welcome to our dedicated section on the 2005 New Zealand Disc Golf Nationals. 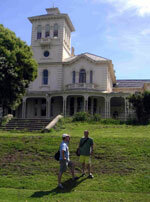 Monte Cecilia Park, Hillsborough, Auckland. You can view our Super Analysis Sheet by clicking on the image above - this 566kb interactive spreadsheet page will then open in a new window. You can see all the interesting stuff, like the fact that Juan Unda fired the best front nine of the whole tournament - 23! Wow! Am I primed with enthusiasm for the game we all know and love so well? Yes, I am. And do you know why? A long time ago, in a galaxy far, far away - November last year in Canberra to be precise - I had the bad news that my return trip from skiing in Japan would involve a 6 hour stopover in Auckland. 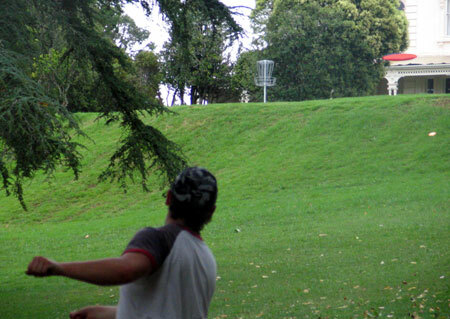 A couple of days later, a certain Mr Bob Gentil sent this forum an open invitation to play in the NZ Discgolf Nationals, on about the date I would be in Auckland. Fate! After some hasty travel rearrangements, a few weeks on various Asian island nations, and a hellish overnight flight from Japan, I found myself navigating the unfamiliar streets of Auckland to find myself at Monte Cecilia Park, on a hot and humid afternoon. That's right, hot and humid. Typical Auckland summer weather! Everything we were told as children was a lie! I was soon joined by the reigning NZ Champion Simon Feasy and host for 3 nights (many thanks Simon and his wife and daughter Yvette and Talia for pleasant and comfortable accommodation offered in faith to a complete stranger), who instantly calmed my travel-ravaged soul by guiding me over the course and demonstrating what a civil and friendly bunch the NZers are. On the other hand, he scared the sh*t out of me with his casual and apparently effortless mastery of the game. "Are all NZers like this?" I thought to myself. 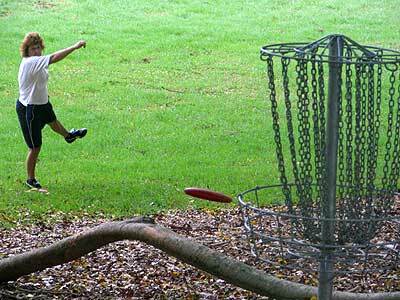 Has some mad island dwelling genetic engineer created a master discgolfing race? 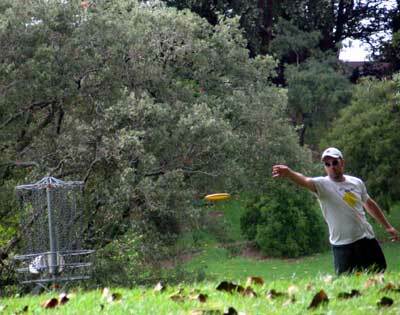 During the afternoon, several more discgolfers appeared, usually carrying what appeared to be very refreshing beverages indeed. After a great meal and some replenishing sleep at the Feasy household, we headed down to the course for the 2 round doubles comp. I was teamed with Gene Tutaki, who proved a companionable partner who consistently came good when placed under the pressure of my less than strategically ideal shots. A day of doubles is a great way to get to know the course, and to meet a few of the other players while not under really intense competitive angst. Not that NZers seem to suffer much of that! The course was REALLY hilly! I've never played anything like it. And the 1st day of the singles was REALLY windy! I haven't played in wind like that for years. These days on a day that windy, we stay at home. Not the NZers. I gather it's a fairly windy place. Despite the wind, the golfing was very enjoyable, the course being a well-thought out and technically demanding test for players of any level, with all styles of play. The tourney dinner was on that night, which was most enjoyable and I think may have distorted a few handicaps on the following day's play. 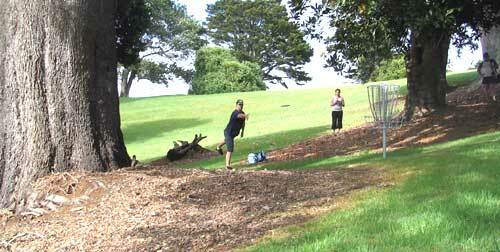 38 players from all over NZ, really cool portable baskets which play better than some permanent ones I've used and which are bought to the course by players who own them. Jeez, they've got a good DG scene over there: a tour which covers the country, several tournaments, and fantastic comradery. 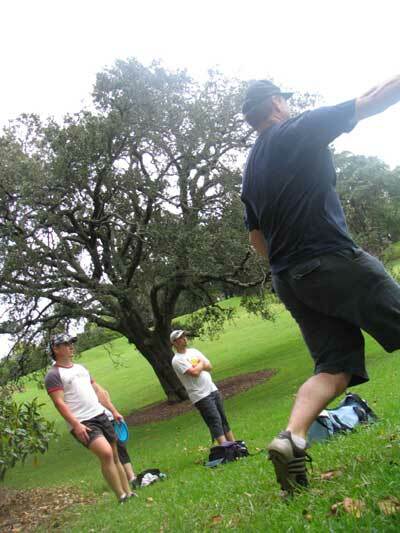 I recommend attendance by anyone looking for a good 3 days of discgolfing, with a great crew. 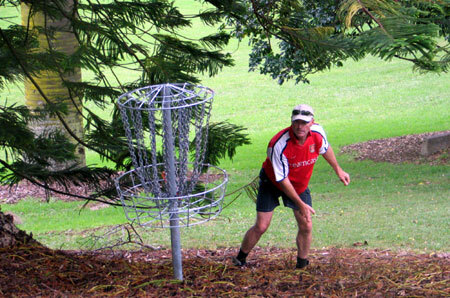 For more details of scores, and photos of the course and rounds, see www.discgolf.co.nz, and go to the NZ National Championships page. Many thanks also to Arthur the mad Dutchman, for great company on one of the best little road trips I've ever taken, and to Bob, Cherie and Toby Gentil for accommodation and great company in the bosom of their loving home. Josh Smith lets loose that fiercesome forehand on the difficult par 3 2nd. The mighty Mexican Juan Unda fires a confident par on the 3rd, beginning the round that will become known as the 6-Under from Juan Unda. Seeing Chris Kingsnorth in the top group is no longer a surprise. That 72 hours practice a day is really paying off. The Scarb fires his second eagle of the day on the par 4 7th. An awesome drive is good, but backing it up with a confident chain chinger is even better! Here he throws with conviction for birdie on 4. 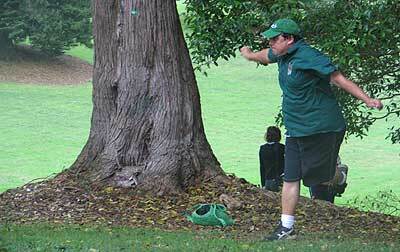 Smarty Marty from Auckland was so busy trying to get into Arthur's head that he threw a girlie-type drive on 6, having to then desperately try and save a par. Josh Smith confidently attacks the pin on the 7th. With his arm-raising action, it wasn't a good idea to stand to his right - pheeew! New National Women's Champion 'Kaching' Ming danced her way around Monte Cecilia Park with such vigour, she could hardly walk at the end of it. She has applied for carts at the next tournament! Well done Ming! With the grim poker face that will not tell you if it's gonna be a lay-up or a strike at the chain, Brett fires one in on the par 3 8th. "Yeah man!" - cool and confident Fish directs a putt into the chains on hole 8. Even when it rained, The Fish kept on those menancing shades, just to intimidate the opposition, perhaps? 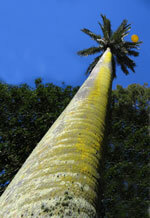 Up and away! Josh Smith is certainly the master of a smooth, incredibly strong forehand drive, as evidenced here with a pin-high hurl on the steep uphill 9th. Into the strong head wind on the massive par 4 10th quite a struggle, one of our international stars, Arthur Booschkie Wooshkie tried the Dutch Shuffle, a wind related version of the African Rain Dance. 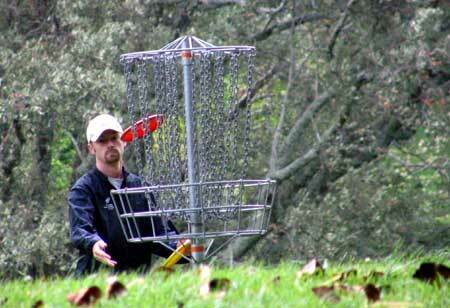 With his albatros-wide arms, the friendly flatlander actually glided down the fairway behind his disc, but forgot his bag. Super chef Smarty Marty somehow stole the Freaky Styley DAKAR trophy from the FS crew. Quite unbelieveable considering how often he was climbing fences and trees to retrieve his disc...an inquiry will follow at the Claddagh. Tricky. One of the 'descriptive' terms used by players for the 14th - one of the hardest holes throughout the tounrnament. 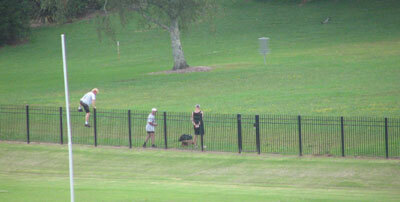 Here Steve's fellow players watch the stress on his body as he forces the heavy shank into his drive.